First, what is panic hardware? 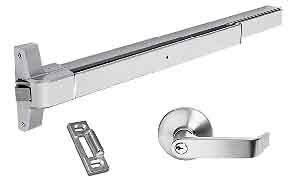 It is a door component that was designed to allow fast and unencumbered exit from a doorway. Panic hardware is typically found on hallway doors to aid in the smoke, fire or heat control of a hotel, hospital, or office building. In addition, it can be found on the exit doors of most high traffic buildings such as movie theatres, large arena complexes, or restaurants. Panic hardware is necessary in almost any place where swift evacuation from a building may be the difference between life and death. The most basic device is a stand-alone piece of hardware that provides egress only. More information about evacuation, exit routes and door access you can visit The United States Department Of Labor, Occupational Safety and Health Administration, Evacuation & Shelter-in-Place. The most vital aspect of all panic devices is that no special knowledge is required to use them. One simply pushes a rod or a bar, causing the latch mechanism to retract. The person can then push the door open and exit the building. These types of devices function differently than a typical door lock, in that they are designed to allow exit without the use of a key or any rotary motion of any kind. They are typically installed in the path of travel toward the exit of a building or controlled corridor. These devices are supposed to be equally suitable for the usage of both handicapped and able-bodied individuals. Most modern panic devices are commonly referred to as “Crash-Bars”. This piece of hardware is generally made up of a flat integral component that when pushed against, retracts a latch mechanism. There are several options for the exterior side of a door equipped with a panic device. Some panic devices can be used as an exit only, and there can then be no reentry through this doorway. Some exit only doors will also have a keyed lock cylinder on the exterior side of the door that would retract the latch mechanism when the key is turned. 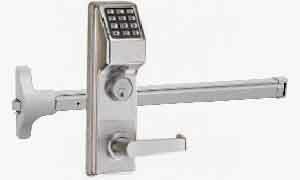 This allows an authorized user to open the door from the exterior side of the opening. 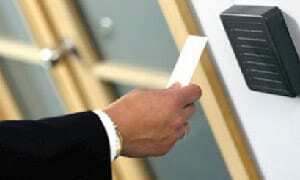 In some more sophisticated installations, a card key reader or push button entry code reader could be used to retract the latching mechanism. Many higher security options are available as well, depending on the landowner’s preferences. What Is A Panic Bar? 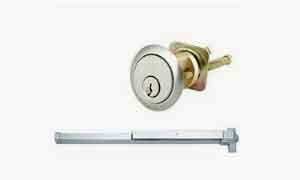 A panic bar is a form of lever tumbler lock for unlocking a door during emergency conditions. 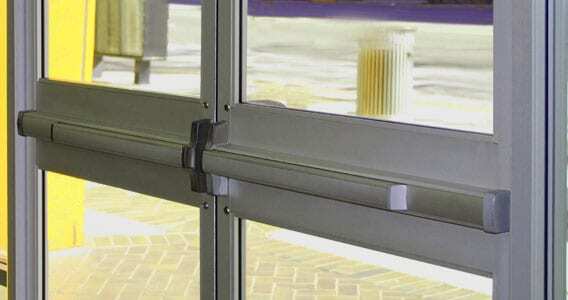 The mechanism consists of a spring-loaded metal bar fixed horizontally to the inside of an outward-opening door. When the lever is either pushed or depressed, it activates a mechanism which unlatches the door allowing occupants to leave quickly from the building. Building codes (or regulations) which require all public buildings have a minimum number of fire and emergency exits. Panic bars are fitted to these types of doors because they are proven to save lives in the event of an emergency. Emergency exits are required, the crash bar works efficiently to allow people to pass through security doors without a reduction in speed. Another common feature of many panic devices is the ability to “dog-down” (to hold open or restrain the device from latching). This feature can be used when a panic device is in an area that needs to remain unlatched, such as in a doorway of a restaurant or store where the fire code requires that the premises remain unlocked during normal business hours. Depending upon the conditions of the installation, panic devices can be installed individually or work in pairs. Some panic devices are activated electronically, have built-in delay circuitry, and are capable of being integrated into sophisticated monitored alarm and access systems. Additionally, they can be fire rated or unrated. Injuries resulting from panic hardware are quite common. Most often, they are a result of shoddy installation, lack of maintenance, and/or cheap parts. As New York’s premier door repair and hardware expert, our technicians have installed and serviced thousands of panic devices and similar hardware to ensure that this will never happen to our customers and those they serve. However, when panic hardware is improperly installed by inexperienced technicians or has been damaged by abuse or poor maintenance, the effectiveness of its intended function cannot be assured. Misalignment of latching components can be the cause of panic device failure. Alternatively, devices that were improperly positioned can also fail by not releasing to allow the unrestricted egress as required from an area, potentially trapping someone inside a hazardous area. For this reason, proper installation and maintenance of panic hardware are essential. Exit alarms are typically used to notify users of unauthorized exits. They are just as useful as products that alert users when doors are opened, and for entrance into monitored areas. 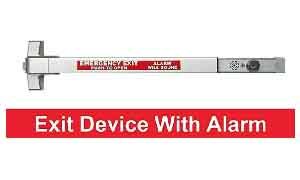 Exit Alarms are for unlocking a door and sounding an alarm during emergency conditions people of an emergency panic device, or a push bar. When the lever is either pushed or depressed, it activates a mechanism which unlatches the door and sounds alarm allowing occupants to leave quickly from the building. For more information please contact NYC DOORS AND MORE at (212) 202-0491.